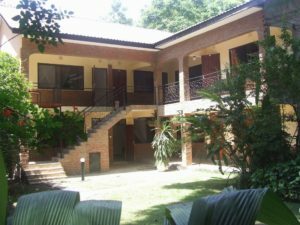 We opened our doors in 1994 and were the first Bed and Breakfast in Arusha. We are family owned and provide clean, comfortable accommodation at reasonable rates. Our on-site restaurant offers fresh, tasty food made from local, seasonal ingredients. There is free Wifi in the cafe, restaurant and bar, as well as a swimming pool and conference room. We are situated in a leafy residential area close to the town centre – around 20 minutes’ walk or 5 minutes’ drive to the clock tower roundabout. The main house belonged to the renowned conservationist Bernhard Grzimek, one of the key founders of the Serengeti national park and Director of the Frankfurt Zoological Society (1945 to 1974). Steve and Cathy Attwell brought the house from the Grzimek family and have retained strong links with the Frankfurt Zoological Society. The Outpost has been the home away from home for many researchers and conservationists from the Society over the years. We use energy saver lights as much as we can, although these are sometimes difficult to get in Tanzania. We carefully care for our grounds and take care of the trees, which support many bird species, including large Silvery Cheeked Hornbills and Galagos (Bush Babies). You might also see hedgehogs scurrying around the foliage at night and chameleons slowly moving through the garden during the day. 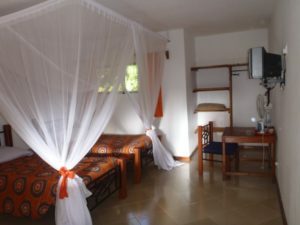 We offer a warm, and safe atmosphere for all those who pass through our gates and are proud to have been one of Arusha’s first hotels to be completely accessible to guests with physical disabilities. Including Jeremiah, the Head Gardener, who has tended the gardens on the property for over 30 years. Mikdad Omari, the Outpost manager, has worked here for over 20 years. The employees at the Outpost are one of the best things about the place and we try to look after them as much as we can. We genuinely care for every staff member and have always supported them and their families. We try to employ promising people from the Arusha-Kilimanjaro region and train them internally, both graduates and non-graduates. We’ve designed training courses to appeal to and benefit people wanting to work in hospitality in this particular region and have employed a training and development manager for this purpose. We try to provide promotion opportunities for our employees as everyone who works here is part of our family.